My wife and I learned tonight of the sudden death of a beloved friend, Fr. Jacob Myers. Fr. 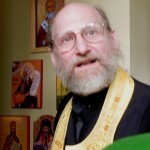 Jacob was Rector of St. John the Wonderworker Orthodox Church in Atlanta, Georgia. I do not think there is anyone whom he met who could not count him as a friend. He was one of the most tireless workers for Christ I have ever known. Early in my priesthood he invited me to come down to his parish and serve three liturgies with him over the course of three days. It was a wonderfully “priestly” act of hospitality and so like him. I never knew anyone to love the priesthood more than he. I will miss him deeply as will my diocese and the larger Church. I gave Fr. Jacob a ride to the airport in Dallas, TX, once. He saw a man begging by the side of the road. I stopped at a stoplight and Fr. Jacob insisted that I roll down my car window. He called the beggar over and handed him money through the window. “Pray for the priest Jacob who is traveling!” he called out. He ran a feeding program for the homeless from his parish next to Grant Park in Atlanta. He has created an army who will no doubt pray for the priest Jacob in this last great journey. They will also need his prayers to help them endure so great a loss. Atlanta and the world lost a great soul. Please remember the priest Jacob in your prayers and his beloved wife Matushka Rebecca, their daughters, Brigita and Gabriela. Grant rest eternal and blessed repose, O Lord, to the priest Jacob who has fallen asleep. And make his memory to be eternal!